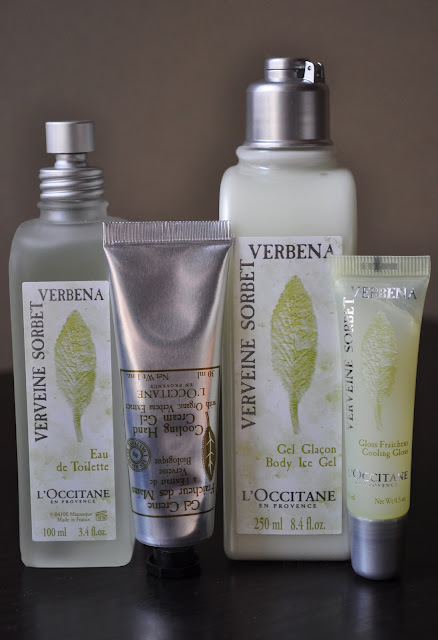 Here's the right of my purchases from the L'Occitane Sorbet Verbena Collection. Sorbet Verbena Eau de Toilette (¥6,300): Another gorgeous fresh, clean, Summer scent from L'Occitane. Sorbet Verbena is a zesty blend of verbena, lemon, lime and mint. Verbena Cooling Hand Cream Gel ( ¥1,470): This hand cream gel absorbs quickly, leaving the skin feeling moisturized (non-greasy), soothed, and cooled. Sorbet Verbena Body Ice Gel ( ¥3,990): A lightweight body gel (once again, non-greasy) with a subtle cooling effect. Sorbet Verbena Cooling Gloss ( ¥2,310): A glossy (non-tacky), moisturizing gloss with a refreshing cooling sensation. I've been loving these products, and they're really helping me keep cool this Summer season!! everything in this collection sounds so yummy and amazing! Love the packaging! !